Made from 100% French Oak – in the Breton village of Bourgbarré, Panaget is just one of the many suppliers of hardwood & engineered flooring available to our customers and we thought you’d love to see the incredible finishes we have available, just check out the Gallery for some great ideas on making your home look absolutely fantastic with Gallic charm infused in every piece of French Oak flooring. The team were delighted to be installing this impressive flooring for a client in Central Southport last week. 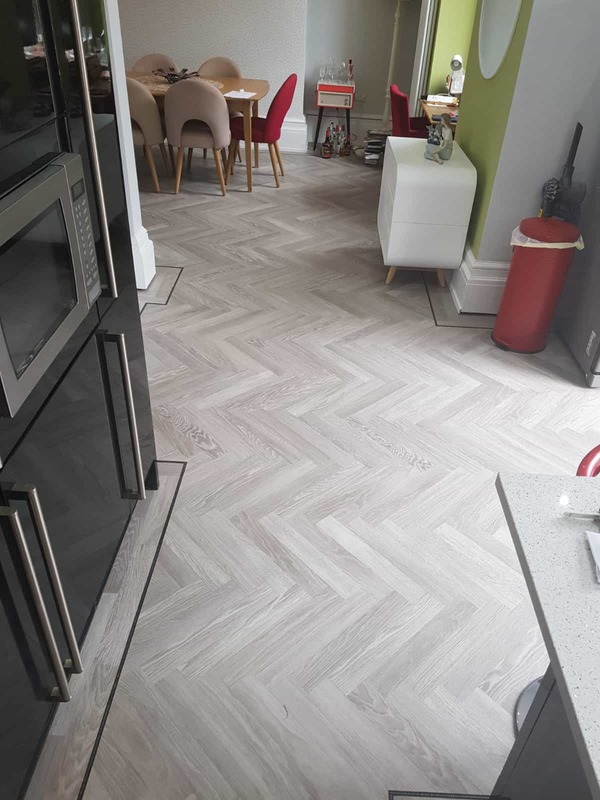 It’s Karndean Knight Tile Herringbone plank that’s only been on the market a few months with a cross grain triple design strip border and we think it looks absolutely stunning! Not only were our fitters pleased with the results but the client was too and that’s what we aim for – we get a real kick out of helping our clients transform their homes, schools, offices & clinics into places where they love to spend time. If you fancy some Karndean in your life, pop along to our Eastbank Street Southport Showrooms and take a look at the huge selection of Karndean & other flooring we have on display. 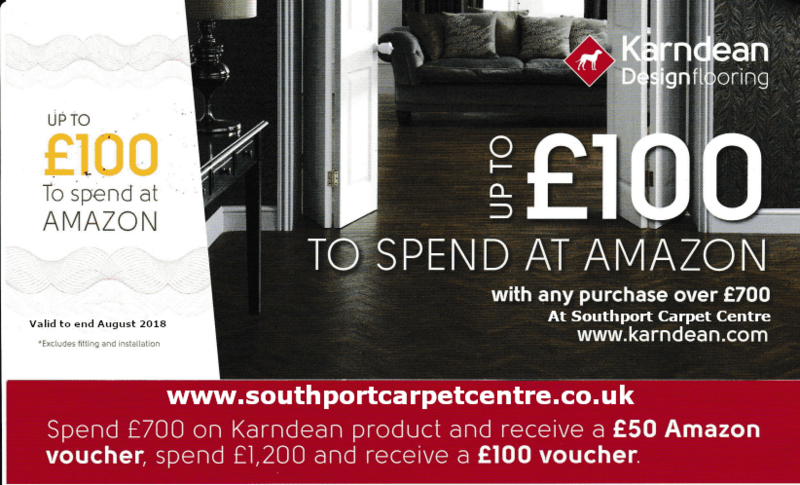 And don’t forget, August is your chance to grab a Karndean discount from us here at Southport Carpet Centre. With our fantastic July & August promotion, there’s never been a better time to treat your home to gorgeous Karndean flooring from Southport Carpet Centre. Karndean Designflooring brings the beauty of natural flooring to your home with easier installation & needing less looking after. 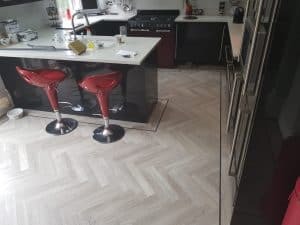 From the rich variety of wood grain through to the textures & complexity of limestone or slate finishes, your Karndean flooring complements your style and is a comfortable and practical choice. Each plank and tile is carefully designed for authenticity. They don’t look uniform or manufactured, but convey all the great characteristics of natural materials. Colours are defined with variable shades and tones, just as they are in natural wood or stone. Karndean flooring is softer, warmer to the touch, and easy to clean without the porous qualities of wood and some stone flooring. All this comes with the latest technology and durable materials to make Karndean Designflooring last. Karndean comes with a Lifetime guarantee on our floors providing you with a long lasting investment for your home. And now, working in conjunction with Karndean, Southport Carpet Centre is delighted to be able to offer upto £100 in Amazon vouchers* when you purchase a Karndean installation from us before the end of August. Terms & Conditions apply. Please ask in store for details. There’s lots of new housing being built at the moment around Sefton & West Lancs, all within easy viewing distance of our showroom here on Eastbank Street in Southport. There’s the Grange at Yew Tree Park in Burscough, Highgrove Park in Ormskirk, Briars Lock in Lathom, Tarleton Lock and Roseacre Gardens in Rufford to name but a few. Check out our longer article about local housing developments and if you’re moving house shortly then come talk to us about our whole house superdeals! 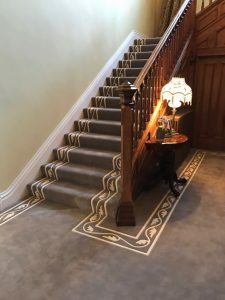 The team at Southport Carpet Centre was delighted to be able to fit a truly unique, bespoke carpet across several floors of a client’s home in West Lancashire recently. This is a hand carved, bespoke sized, handmade 70oz 100% wool Saxony carpet with an inlaid vine design. It was precision measured to exacting tolerances to enable the perfect, balanced positioning of borders that you can see. We even created carved inlaid rug style areas to go around two coffee tables. We’re delighted to have worked in partnership with Andrew & the team at Bronte Carpets who manufactured this custom made carpet in their Lancashire Mill factory. Created seamlessly over 20 feet wide, the carpet took ten weeks to manufacture and was then installed by our own fitting team using conventional stretch fitting onto gripperod over a luxurious 10mm high density underlay. Our client is delighted and so are all the team here at Southport Carpet Centre. What makes it even more special for us is that we carpeted the same property for the previous owners some years previously. We’re very proud of our reputation and as the region’s carpet specialists we’ll gladly help you with anything from the simplest rug, whole house carpet deals for new builds, the hall, stairs & landing refresh right through to something truly bespoke & unique like this.